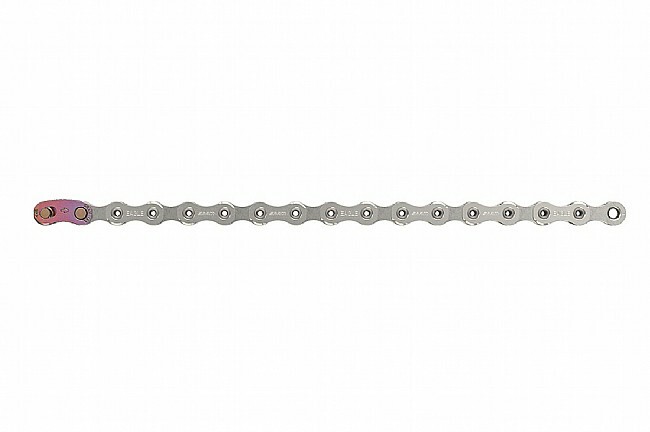 SRAM put in some serious time and effort to create a chain that was up to the task of handling the severe angles and demands of their Eagle 12-speed drivetrains. It's safe to say the 126 finely-crafted links of the PCX01 chain accomplishes this brilliantly, all while functioning smoothly, precisely, and silently. To do this, the engineers at SRAM removed all square edges and chamfers from the inner plates for what they call a Flow Link design, resulting in a narrower, more flexible profile with a flatter outer-plate for increased strength. Add to this a Hard Chrome™ treatment on the rollers and inner links, and now you have a long-lasting perfect match for your XX1 or X01 Eagle drivetrain. Hollow pins. 126 links. Compatible with SRAM 12-speed drivetrains only.